Of all the celebrities who served during World War II, Jimmy Stewart was unique. When the attack on Pearl Harbor woke many to the reality of WWII, Stewart was already serving with the Army Air Corps at Moffet Field. Seeing war on the horizon, Stewart had enlisted several months earlier. 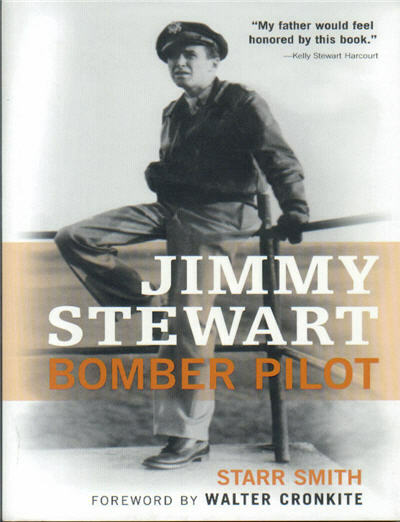 Book chronicles the star’s journey to become a bomber pilot. Recounts how Stewart’s first battles were with the Air Corps high command, who insisted on keeping the naturally talented pilot out of harm’s way as an instructor pilot for B-17 Flying Fortresses and B-24 Liberators. Stewart managed to get assigned to a Liberator squadron in the mighty Eighth Air Force. He rose to command his own squadron and flew twenty combat missions, including one to Berlin. "This partial biography and its subject are fairly described as unassuming but highly competent. Smith served as an intelligence officer with Stewart and frankly admires him. The movie star possessed both an Oscar and a pilot's license before World War II broke out. Too old for cadet training, he took regular pilot training and transitioned into heavy bombers. Ultimately, he flew 20 combat missions in the daunting B-24, rising to the command of a wing and filling several staff positions with equal capability. Several senior-officer mentors, recognizing his competence as more than merely respectable, secured him combat assignments when Hollywood and the air force would probably rather have kept him making training films. His postwar service eventually saw him attain the rank of brigadier general in the Air Force Reserve and exceed Mach 2 in the back seat of a B-58. Smith un-star-biographically dishes no dirt, possibly because, like other Stewart limners before him, he found none to dish, though he might have quarreled with Stewart's old-fashioned Middle American virtues, one supposes." "Smith (Only the Days Were Long) served with Stewart (1908-1997) in the Eighth Air Force during 1943-1944. They were stationed in East Anglia, England, but Smith opens this memoir of their service with Stewart's New York homecoming in 1945. By then, Stewart had led 20 missions over enemy territory and had been awarded the Distinguished Flying Cross with Oak Leaf Cluster, along with other decorations. Smith, whose later career included stints working with Air Force brass and in the reserves, takes readers through Stewart's entire WWII service, including his fight with the studios to let him enlist, his training and his deployment. The bulk of the book concerns action in Germany, and will be of great interest to flight squad buffs. The final chapters make brief stops at Stewart's post-war marriage, his eventual promotion to Brigadier General and the establishment of the Jimmy Stewart Museum in Indiana and the Mighty Eighth Heritage Museum. Smith's clear admiration for Stewart comes through on every page, but with an understatement that even George Bailey could have lived with." 288 pages, softbound, 5.5 x 8.5, 64 photos.